Rhubarb is in season right now and anyone that has a plant or two knows that rhubarb can be quite prolific under the right conditions! Even if you don’t happen to have a plant it seems like you can still end up with quite a bit of rhubarb from friends, family, and neighbors that have been bountifully blessed. Harvest season for rhubarb is late spring through early summer. Rhubarb plants will keep growing after that but they tend to get bitter in the heat, even if you keep them watered. It’s best to just harvest what you can while you can and then leave the plant be until next year. Don’t harvest rhubarb in it’s first year. Rhubarb plants need 2 years to be fully developed. If you leave them be the first year they will have a better chance at growing a strong root system and then they will be ready to produce for you for years to come. Rhubarb stalks are ready to be harvested when they are firm an no longer bendy. Bendy rhubarb will be too stringy and tough to cut through and eat. Don’t let your rhubarb get too large either or it will get bitter. Your best bet is to check your rhubarb plants for harvest each day or every other day in the least. When you pull the rhubarb from the plant, twist the bottom so the stalk pulls cleanly out from the ground. Don’t cut the stalks or it will cause growth issues for the remainder of the plant. Brush the dirt from the stalks you pull. Cut the leaves off the stalks. They are poisonous and can’t be eaten by humans or animals. However, the leaves make an excellent addition to your compost pile! When you harvest the rhubarb make sure to never pull more than 30% of the plant at a time or it’s roots will become unstable for future harvests. Rhubarb stores well in the fridge, or you can chop it up and freeze it to be able to enjoy all year long! 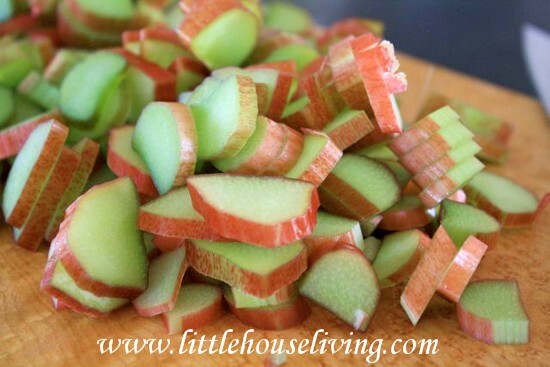 You can also preserve it by canning, read all about Canning Rhubarb here. Now it’s time to get some inspiration on how to use up all that rhubarb! 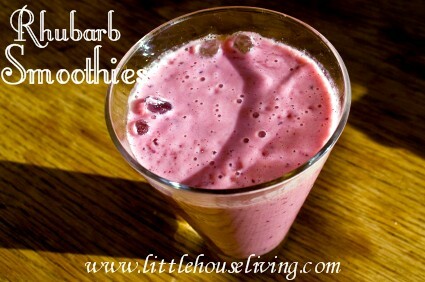 Here’s a great Rhubarb Smoothie recipe that you have to try. Using a blender, add your fruit to the bottom, ice and then top it off with your honey, milk, and pomeganate juice. Mix well until all ingredients are smooth. Makes 2 servings. This Rhubarb smoothie recipe is a great way to really enjoy the fresh taste of early summer since rhubarb has such a short harvesting season! How long have you been harvesting rhubarb? What’s your favorite rhubarb recipe? 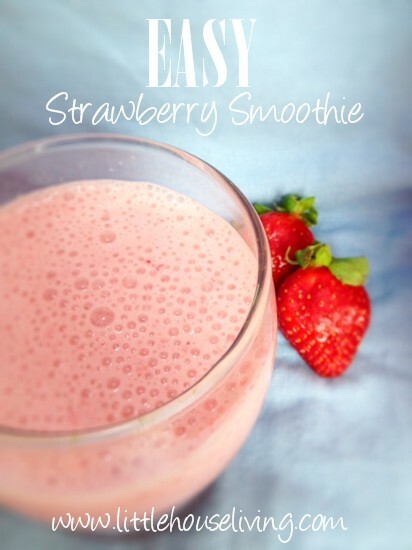 Will you give this rhubarb smoothie recipe a try? I’m growing rhubarb for the first time in my garden this year, and am starting some from seed as well. I can’t wait to harvest some next year for a strawberry rhubarb crisp, and I think I would like to maybe try some sort of oatmeal cookie with rhubarb in it as well. Yum, and it’s pretty in the garden too! Mmmm, Rhubarb cookies sound good! I have been enjoying rhubarb crisp. I am gluten free and dairy free, have not figured out the flour mixes to substitute for my favorite pie. make that strawberry rhubarb crisp that I have been enjoying this season. Excellent tips – I copies & pasted in my ‘Gardening Stuff’ doc folder. Thanks so much!! A. Gardeners should stop harvesting well-established rhubarb plants by mid-June. Continued harvest through the summer months weakens the rhubarb plants and reduces the yield and quality of next year’s crop. The rhubarb stalks do become somewhat woody by mid-summer, but they don’t become poisonous. I’ve used rhubarb in crisps (my favorite), pies, sauces, and jams – but never in a smoothie. It looks good! Visiting here from Motivate Me Monday. I lo-ove rhubarb! Since we’re buying a house this summer, I hope to plant some rhubarb and your harvesting tips are going to be a big help in 2 years 😉 Thanks for sharing at Inspire Us Thursday. 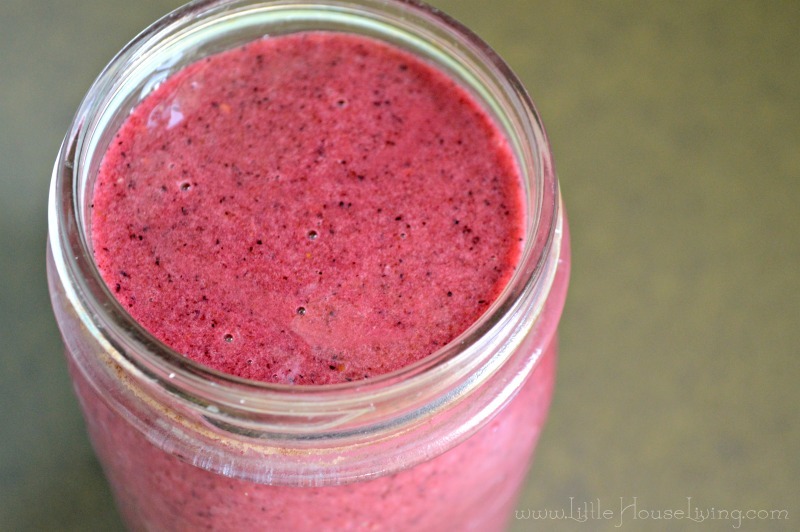 I never thought about putting rhubarb in a smoothie before! I’m in New England so our rhubarb isn’t quite ready yet, but can’t wait to try this when it is! Never seen it in a smoothie. Yumm!! My dad used to say the only good place to grow rhubarb was next to the garbage so you could cut it & throw it away. Unlike him, we love it! This sounds really good! Looking forward to trying it. I have made smoothies before with frozen rhubarb but not with the other ingredients you listed. p.s found you through Friendship Friday! Smoothie you say? I’m intrigued. I have some rhubarb that should be good to harvest this year, might give it a try! I just love rhubarb, but never thought of adding it to smoothies. Thanks for sharing with us at Simple Supper Tuesday. I love rhubarb and I look forward the season! It looks so good and adding it to a smoothie must add a nice zesty taste! This definitely sounds like a winner! Thanks for linking at #pintasticpinterestingparty I can’t wait for Rhubarb season around here! Oh! I have never tried a rhubarb smoothie. Bet it’s delish! I adore rhubarb and would love to have one in our garden. This smoothie sound lovely. Thanks for linking up to Sweet and Savoury Sunday, stop by and link up again. Have a great day!! I want to hear comments from someone who has tried the smoothie. Kind of scares me, having raw rhubarb. I would think it would be hard on my digestive system.My favorite way to have rhubarb is Fabulous Rhubarb Cheesecake. A favorite with everyone who has tried it. 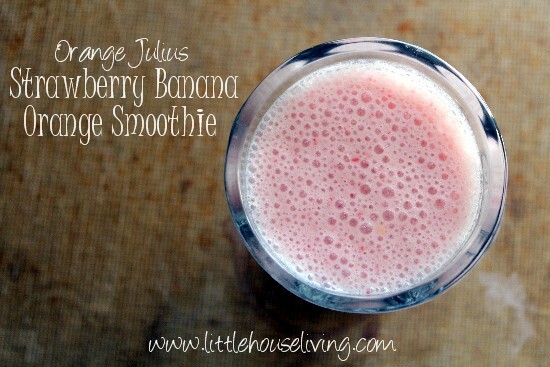 I will be trying the rhubarb in the smoothie – sounds yummy. We have been growing rhubarb for the last 3 years. One of my favorite recipes is rhubarb, ginger,& lime jam. It is great on toast, bagels, pancakes and can be used as a chutney with pork or chicken. I lolve dem’ barb’ recipes, but when I clicked print, it said 12 pages. Would you have shorter versions of the recipes? Hi Brice, if you click on the little print icon on the left side of the page you can select which parts of the text that you’d like to print and delete the rest. I hope that helps! The rhubarb is raw? Never heard of using it that way.